Paul Cook hailed the ‘top quality’ of Nick Powell after another virtuoso performance in Wigan Athletic’s thumping 3-0 victory at pre-season promotion favourites Stoke. Latics deservedly picked up their second Championship victory of the fledgling campaign in the Potteries, thanks to a brace from Will Grigg and another from Gavin Massey. But the performance of Powell in the free role behind Grigg simply oozed Premier League class. “I think when you look at a performance like that...Nick’s just a very special player,” enthused Cook. “He just has that individual quality that can light a game up. Powell’s display managed to get under the skin of Stoke centre-back Ashley Williams so much that the Wales international - after a running battle with the former Manchester United man - was finally sent off for lashing out at substitute Josh Windass with 13 minutes to go. When Powell left the action early, it was to a standing ovation after his substitution just four minutes later, leaving Cook to praise his players’ temperament in staying the right side of the line. 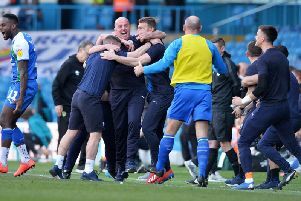 “There’s a lot of competitive players out where, the pitch was magnificent, and it made for a flowing game,” the Latics boss added. “As a manager, you’ll always back your own players, and trust them to do the I right thing. Cook also acknowledged Latics had ridden their luck in the early stages, when Stoke had a goal controversially disallowed for offside, and a decent penalty shout for handball against Cedric Kipre waved away. “Everything’s gone our way on the night, hasn’t it?” he added. “I thought Stoke put us under a lot of pressure from the off, and will really feel they should have scored a goal during that period. “We always felt we were going to get moments in the game, and I thought the key moments went our way. “We scored our goals at good times in the game, and it ends up being one of those performances where you say: ‘Yeah, it looks good on paper’.